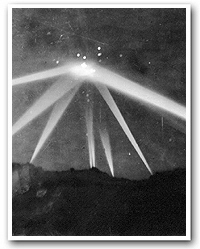 Tomorrow marks the 74th annivesary of the 1942 invasion of Los Angeles by a UFO. The Great LA Air Raid is what it is known as best. 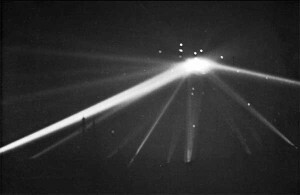 At 3:16 A.M. on Feb. 25th, 1942 Los Angeles air raid sirens blew in response to what was believed to be a Japanese aircraft attack. This was a mosterous discharge of of anti-aircraft fire. Over 1400 shells were fired in a frantic effort to defend the west coast city. How is this possible? With that many shots fired, it is highly unlikely not one of the invaders would have been brought down. Eye witness descriptions of the invaders describe the craft as an enormous “lozenge”. Hmm.. The U.S. Navy and War Department’s conflicting acounts of the incident made the battle even more suspisious. To make matters more interesing, a photograph of the event shows what appears to be a saucer shaped craft highlighted by several spotlights and it is enveloped by anti-aircraft fire. There are what looks to be 9 search lights focused on this UFO. Yes, it was Unidentified. Yes, it was Flying. Yes, it was an Object. Another intersting fact of this encounter is that it took place 5 years before the Roswell incident. Had this object been a weather balloon, a Japanese balloon bomb or a German zepplin it would have been popped by the defensive action and recovered. Made By Aliens And Artists?